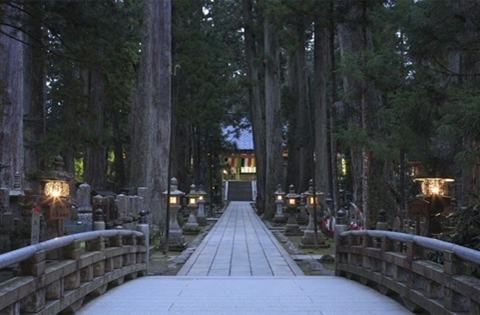 Mt Koya (Koyasan) is the centre of Shingon Buddhism, which is one of the most important sects of Buddhism in Japan. It was founded by Kobo Daishi in 805. To this day Mt Koya remains a spiritual retreat, one of Japan’s holiest places and the best place in Japan to spend a night in a Shukubo (temple lodging). Interact with the resident monks and enjoy ‘shojin-ryori’ meals of traditional Buddhist vegetarian cuisine. Upon arrival in Osaka, explore the bustling, friendly, food-lovers city. Enjoy the panoramic city view from the floating observatory in Umeda district. Discover your favourite local street food in Dotonbori and don’t miss the impressive Osaka Castle. Make your way to the sacred Mt Koya, one of the Three Holy Mountains of Japan. Experience the majestic Okunoin and stay overnight in a temple lodging (Shukubo) with authentic Shojin-ryori – Japanese Buddhist vegetarian cuisine for dinner and breakfast. Participate in Buddhist Morning Mass, then explore more of the holy Mt Koya at your own pace. Visit the Danjo Garan temple complex and Kongobuji Temple. Trek through the Women Pilgrims Route and view the ruins of the ‘women’s halls’ built on the perimeter of Mt Koya. The tranquil mountain path provides an insight into the mind’s eye of the devout female pilgrims in an ancient time. Move on to Kyoto. Take a peaceful stroll around the beautiful, mystic Tadasu no Mori, 12 hectares of forest next to the sublime Shimogamo Jinja Shrine, a world heritage site. After exploring Shimogamo, make your way to its equally impressive sister shrine, Kamigamo. Take an excursion to Amanohashidate, one of Japan’s ‘Three Most Scenic Places’. See the famous ‘bridge to heaven’ and explore the area by foot or by bicycle. Visit Enryakuji Temple complex at Mt Hiei, another of Japan’s Three Sacred Mountains. Explore Hieizan using cablecar, bus, and ropeway. See the Fumetsu-no-Hoto, an eternal Buddhist lamp, which has never gone out during 1,200 years at the Konpon-do Hall. Explore the Todo area, then visit Shaka-do Hall and Ninaido Hall in the Saito area and Yokawa Chu-do in the Yokawa area.